The Stairwell Sisters, the Bay Area's favorite all-gal old-time teardown, formed in early 2000, in a flat overlooking the hills of San Francisco. On December 12, 2000 the band played their first show, opening for Kathy Kallick...ten years, three CDs, and many miles later, the rowdy quintet has appeared just about everywhere you could care to name, from A Prairie Home Companion to New York's Lincoln Center to Hardly Strictly Bluegrass to the "V for Violins" spot on Elmo's World. Recently voted Best Stringband in the East Bay Express, they've certainly covered a lot of ground. 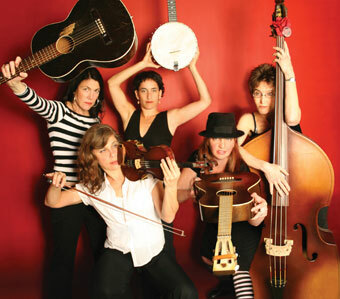 The Sisters—also known as Lisa Berman (Hawaiian slide), Evie Ladin (clawhammer banjo), Martha Hawthorne (bass), Stephanie Prausnitz (fiddle), and Sue Sandlin (guitar)—are steeped in traditional Appalachian music, but that doesn't stop them from playing newer material that suits their style, often with a bent toward social activism. Beautifully reinterpreted through an Appalachian lens, the Stairwell Sisters lend three-part harmony and depth to Bruce Springsteen's poignant "Youngstown," which will be released as a single for this special concert. Celebrating 10 years to the date of their first show, the gals are joined tonight by special guests from their other musical projects. Appearing with the Stairwell Sisters are Keith Terry, Pom Frytz, Knuckle Knockers Karen Celia Heil and Bill Foss, and Crooked Jades Jeff Kazor and Erik Pearson. Prepare yourself for a night of roof-raising acoustic old-time music pumped up with with punk-rock intensity.